Standard Abrasives(TM) Flap Disc, Grn, HP Al Zirc, YF-wt. Poly. Constructed with 25% more material than our standard flap discs, our Standard Abrasives™ Zirconia HP HD Flap Disc offers extra-long life for rapid, high pressure grinding operations. It features extra-sharp alumina zirconia mineral on hard-wearing polyester flaps. The flaps wear away with use to reveal fresh, sharp mineral for beveling, deburring, and edge chamfering. Ideal for use in metal fabrication, the heavy-duty Standard Abrasives™ Zirconia HP HD Flap Disc achieves fast, aggressive stock removal without compromising finish. It is a great choice for high pressure grinding applications, especially on stainless steel when a nice finish and gouge resistance are desired. A grinding aid on the disc reduces grinding temperatures for best results and extended disc life in operations on stainless steel and nickel alloys. 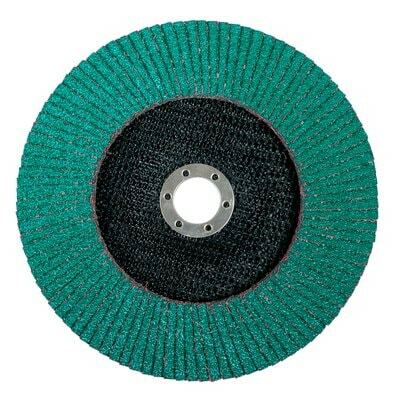 The overlapping layers of coated abrasive cloth flaps make this flap disc flexible, long lasting, sharp cutting, and a great choice for one step grinding and blending. In many instances it can replace grinding wheels and fiber discs, making it an advantageous addition to machine shops and body shops. A flap disc often outlasts a fiber disc while still providing an aggressive cut, so you can count on replacing it less often, which saves time and reduces consumables. It produces a smoother, more consistent finish, and won't curl up in storage as fiber discs sometimes do. Choose one grade coarser than the fiber disc you would typically use for your application for comparable results. We engineered Standard Abrasives™ High Density (HD) Flap Discs with the industrial operator in mind  packed with 25% more abrasive muscle, they deliver exceptional cut and life. High density discs are thicker than standard flap discs due to their wider flaps, and therefore last longer and require fewer interruptions for disc changes. Designed for use on a right angle grinder, HD flap discs have a Type 27 or Type 29 profile. The Standard Abrasives™ brand has supplied quality abrasives to the metalworking industry for over 50 years. Customers rely on our broad offering of high performance products including coated, bonded, and non-woven abrasive lines.